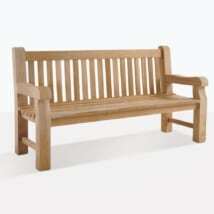 Enjoy the splendor of an elegant and timeless piece of furniture with the Wave Teak Outdoor Bench (2.5 Seat). 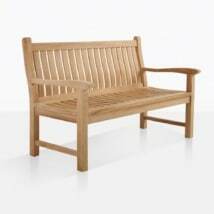 One of Teak Warehouse’s most popular styles, the Wave Teak Outdoor Bench (2.5 Seat) will help you to create a tranquil place for you to unwind after a long day. The Wave range features a solid teak framework and has a stunning, ergonomic design within the curve of the slats. All vertical and shaped to support the lower back and seat; these chairs are not only comfortable but exceptionally pleasing to the eye. 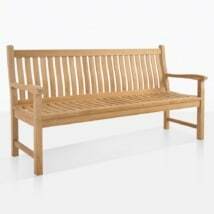 L60" x D25" x H38"
Teak Warehouse is proud to present to you the Wave Teak Outdoor Bench (2.5 Seat) made out of none other than A-Grade Teak, the leader in wooden material for outdoors. Teak has long been desired for furniture for indoors and out, because it is attractive, hardy and strong. The grade A is the top grade of teak, and only given when a teak tree (the Tectona Grandis) has reached around 40 years of age, which means that not only have the plantations aided the environment, but the tree has had time to produce rubber, oil and super strength! We have customers who have come in to purchase a matching bench that they bought when our stores opened! Over 20 years ago! That shows that our product is special, timeless and long lasting. Teak Warehouse in recent times, has explored other materials to give you options for creating a perfect outdoor living room, and many marine quality items to boot! Look into Textilene® and Batyline® meshes, #316 Stainless Steel, Aluminium, Resin, Reclaimed Teak, Raw Concrete and much more. 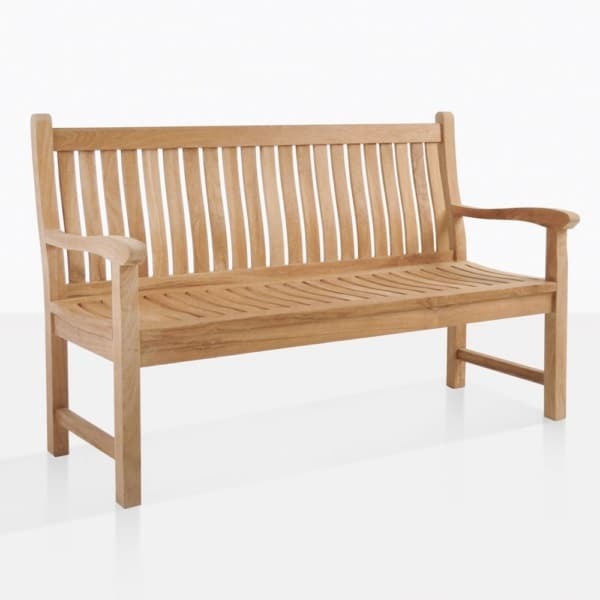 As well as a great many varieties of benches, we carry deep seating options, dining tables and chairs, relaxing chairs, sun beds, pots, planters, umbrellas – you name it – we got it! Our Wave Benches come in three sizes to fit into any space, small or large! Choose from the 2.5 Seater, as shown here, or a 2 and a 3 Seater. We also now carry a Dining Arm and Side Chair, perfect for any of our Teak or Concrete Tables but can also be used as part of a seating creation! Have a small area, but want to seat a lot of people? Purchase the Wave 2.5 and a larger 3 person Bench as well as two Arm Chairs, dress with a few throw cushions in your favorite hue and voila! Instant seating! Instant effect! Perhaps you have a veranda that spans the perimeter of your house, place a Wave Teak Outdoor Bench (2.5 Seat) on each corner, creating a feeling of traditional grandeur and so you can enjoy all four corners of your home! Couple this divine Wave Teak Outdoor Bench (2.5 Seat) with a low lying teak Coffee Table and a couple of low slung wicker Relaxing Chairs in a quiet corner of your garden, you’ll be impressed by the charming collision of materials. Commercial property owners, this Wave Teak Outdoor Bench (2.5 Seat) is perfect for your seaside promenade, or nestled into a Spanish style courtyard, a wonderful retreat for your clientele. 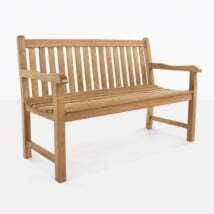 The Wave Teak Outdoor Bench (2.5 Seat) is a classic bench with a difference. Enjoy the effect it has on your space today!